The use of medical marijuana has been debated for decades. The proponents of legalizing it believe that it is an efficient method that can be used to reduce the suffering of millions of people worldwide, while also minimizing the use of more dangerous and addictive narcotic pain killers such as Oxycontin, Percocet, Demerol and Vicodin. Those against the legalization of the drug, for medical purposes, bring up several arguments. These include: The fact that it is a brain altering drug, that too many people will be walking around ‘high’, that it is a public safety risk, and most commonly, that it is very difficult, and in most cases impossible, for doctors to prescribe a correct regulated dose. No one wants half of society walking around high on drugs. It’s just not good for the economy, the environment, or anything else for that matter. At the same time though, marijuana has been proven to be a very effective drug in easing severe pain, and it is much safer than most of the drugs currently being prescribed. 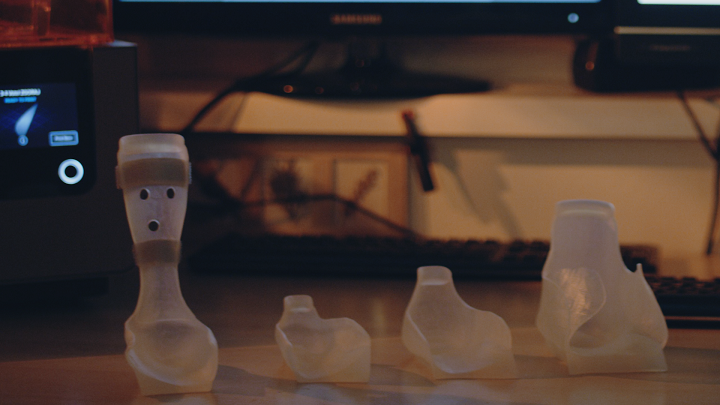 This is where an Israeli based company, called Syqe Medical thinks they have the solution, with a little help from our favorite technology, 3D printing. They have created a device called the Syqe Inhaler, which in clinical trials has helped physicians overcome the unpredictability of prescribing cannabis. As the company explains, prescribing marijuana is greatly unpredictable. Everything from the dosage needed, to the active ingredients and the fact that the effects of the drug differ from plant to plant, and patient to patient. With the help of Stratasys 3D printers, specifically the Objet30 Pro, Connex3, Objet Eden260v and Makerbot Replicator 2, the company has been able to create an inhaler that can completely eliminate the unpredictability of medical marijuana. The Syqe inhaler is able to deliver accurately measured, consistently metered dosages of cannabis, in a very easy fashion. The device takes cartridges that are preloaded with standardized cannabis flowers, containing all natural compounds. It delivers an amount as small as 100 micrograms, which is optimum for pain relief in most individuals, while not providing the mind altering effects that traditional cannabis inhalation or ingestion would cause. The inhaler is also able to be connected via wifi to a smartphone or tablet app which allows both patients and doctors to correctly monitor and administer the correct dosage. Researchers will also be able to see all of the data, in order to help them determine what the best dosages are for different conditions. Syqe Medical CEO, Perry Davidson told Plastics Today that the company has used Stratasys 3D printers to create almost 75% of the parts for the device. This allowed them to rapidly and successfully complete human clinical trials, without the delay experienced with traditional manufacturing means. Not only has the company used 3D printers for the production of these devices, but they have also used the technology for the creation of tools and testing systems. Once full scale production begins, the company expects to shift much of their manufacturing methods to traditional means in order to scale up, but 3D printing has worked so well that they plan to continue to use it for the printing of specific components for the devices. For those of you looking to use marijuana as a recreational drug in order to get a buzz, this device won’t be for you. For those of you who truly want it for medical purposes though, this could be the first step in making cannabis a legitimate medical drug, at least in the eyes of government agencies, politicians, and healthcare professionals. Without a doubt, cannabis has its benefits for medical purposes, but up until now there wasn’t a consistent means of delivering the drug in a fashion that would provide relief while not providing the side effects. “This is the perfect solution to all the challenges today in the cannabis field,” said one government official. Surely there will be those out there who are against devices like this. There are those who are strictly against the use of cannabis for any purpose whatsoever, while there are also those who are only major proponents for the legalization of the drug, mostly because they just want to legally be allowed to get high. Syqe Medical plans to begin use of the device for further testing purposes in hospitals sometime before the end of the year, and then make it available for outside-hospital use sometime in 2015. What do you think? Will a device like this finally end the debate as to whether cannabis should be legalized for medical purposes? Discuss in the 3D Printed Syqe Cannabis Inhaler forum thread on 3DPB.com.